The Advanced Media Specialist position provides professional services in museum-grade wide-format archival digital printmaking; laser cutting and etching; rapid prototyping/3D printing, and 3D scanning. The 75th Issue of the Online Magazine Interartive will be dedicated to the diverse aspects of the current discussion about Copy and Original. Pedestrian Project, the exhibitions and lectures program at Harold Washington College, is currently accepting applications from curators and artists for shows this Summer and through the 2015/16 academic year. 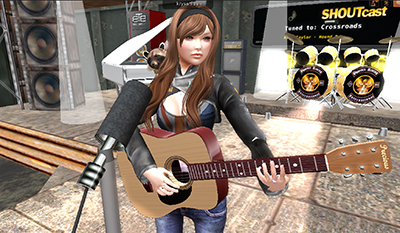 Second-year media student Yunji Johanning moonlights in Second Life as a singer/guitar player, performing regularly to a wide audience.